Dr. Eggman. Evil super genius, Grammy award winner and Fuzzy Puppy gaming pro has taken over Sonic’s Twitter account. The menacing mustachioed mastermind hacked his way onto Twitter and into our hearts with several replies and tweets to Archie comics and Roger Craig Smith, all the way to our own Adam Tuff with a shoutout to our site! 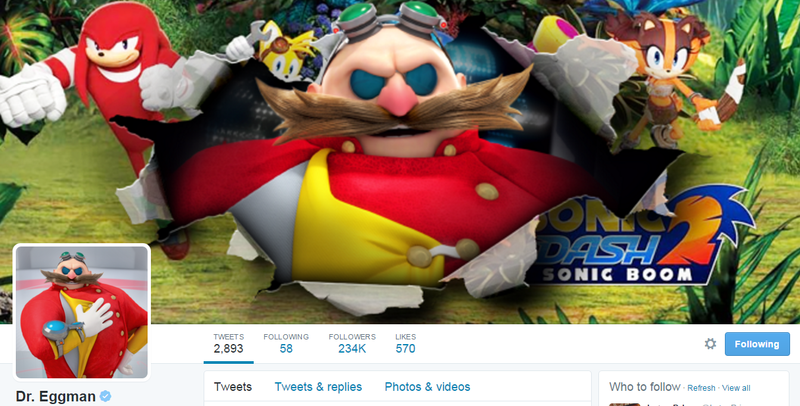 So head on over to Son-er…I mean, Dr. Eggman’s Twitter account and ask him a question. He may even leave an audio reply! All hail the great Eggman Empire!! Hee! Hee! Eggman’s burst through the image gave Tails a mustache. How apropo.